At least crabby has no way of seeing what he’s living in, until he moves out, that is, into another shell. He can freak out then, but for now I think he’s fine. No need to be crabby Mr HKH. Little kids do this sort of stuff all the time, so this doesn’t faze me in the least. And what the little hermit crab doesn’t know won’t hurt him, lol….. 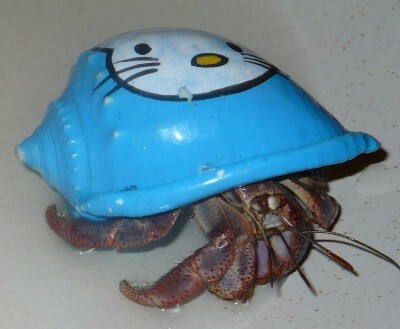 The poor hermit crab looks like it’s cringing from embarrassment, and I don’t blame him. Wow,just more HK junk.Poor crab,it will die when it outgrows it sheell.Oh no wtf!!! !THE BASTARDS PAINTED HK ON MEH!!!!! !MY LIFE IS OVEEEEEEEER! !